Published: Sept. 16, 2018 at 04:05 p.m.
New Orleans Saints kicker Wil Lutz nails field goal to take the lead late in the fourth quarter. Published: Jan. 14, 2018 at 08:05 p.m.
New Orleans Saints kicker Will Lutz nails a 43-yard field goal. 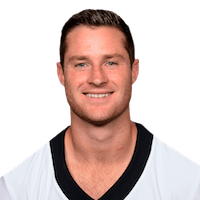 Published: Nov. 19, 2017 at 04:45 p.m.
New Orleans Saints kicker Wil Lutz nails a 28-yard game-winning field goal.